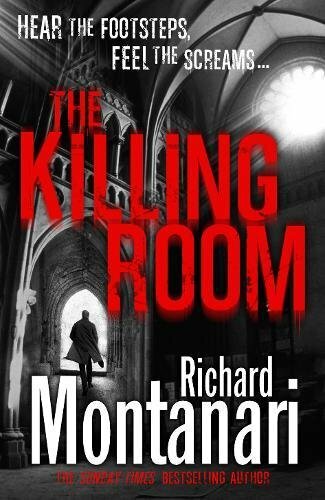 The Killing Room, by Richard Montanari, is the sixth book in the Byrne & Balzano detective series. Homicide detectives, Kevin Byrne and Jessica Balzano, work for the Philadelphia Police Department. They have dealt with dome very strange and bizarre cases but when an anonymous phone call is received with the message “One God. Seven churches” it is the beginning on a new case. There will be 7 brutal murders in the name of God. Abandoned churches are about to become the killers new killing grounds. Their case starts when the body of an ex-cop is found in the basement of an abandoned church, naked and wrapped in barbed wire. He had been kept alive for 10 days before finally dying. This is soon followed by 2 more victims; one frozen in ice and one forced to swallow stones causing suffocation. So far, have 3 bodies with no apparent motive to connect them. Byrne & Balzano now have to find this deranged serial killer before 4 more bodies turn in in 4 more abandoned churches. With no leads, no links between the victims or any suspects they have a very hard task before them. Overall, this is another excellent thriller from the master of the bizarre. Richard Montanari packs his books with thrilling serial killers and certainly doesn’t like his killers to be boring, they all have ingenious ways to commit their crimes. The Killing Room has its own unique serial killer that will stop at nothing to achieve their aim. The Killing Room is fast-paced, thrilling, breathtakingly heart pounding and has plenty of twists and turns. Expertly written it will keep you reading and leave you in suspense until the very final moments. The characters all have depth, are intriguing and believable. Another exciting and thrilling instalment in the Byrne & Balzano series. If you haven’t read any of the series, then I can highly recommend it. For more information about Richard Montanari visit www.richardmontanari.com.